A dam built on the Senegal River in the 1980s wiped out the basin’s population of the African river prawn. A plan to bring them back goes well beyond restoring native biodiversity–it could also save thousands of people from a disease now running rampant among the rural poor in Senegal. The Diama Dam helped secure the West African coastal nation’s supply of fresh irrigation water against encroaching salt water. But it also tipped off an ecological domino effect that led to the outbreak of schistosomiasis, a parasitic disease that attacks the internal organs and can lead to organ failure. Humans pick up the disease through simple contact with shallow river water while playing, bathing or washing clothes and dishes. A free-swimming form of the parasite burrows into human skin. Freshwater snails play host to the parasite for part of its life cycle. In the Senegal River system, the snails—and by extension, the disease—were once kept in check by the African river prawn, its natural predator. But the dam cut off the prawn’s migratory route to its brackish spawning grounds in the river’s estuary. Once its predator disappeared, the snail population grew quickly. Schistosomiasis infection rates rose with it. A drug developed to treat the disease has suppressed infection rates somewhat, but its effects are limited. It’s not a cure and it doesn’t prevent reinfection. That’s one reason that Elizabeth Huttinger is leading an initiative to squash the parasite before human infection can occur. Huttinger leads Project Crevette (French for prawn), a plan to reintroduce African river prawns to the Senegal River basin. If it works, the plan could cut infections, restore a native species and create a local marketplace for the prawn, which is a favorite in restaurants worldwide. Huttinger hatched the plan when she was working for the United Nations Global Fund on disease issues. 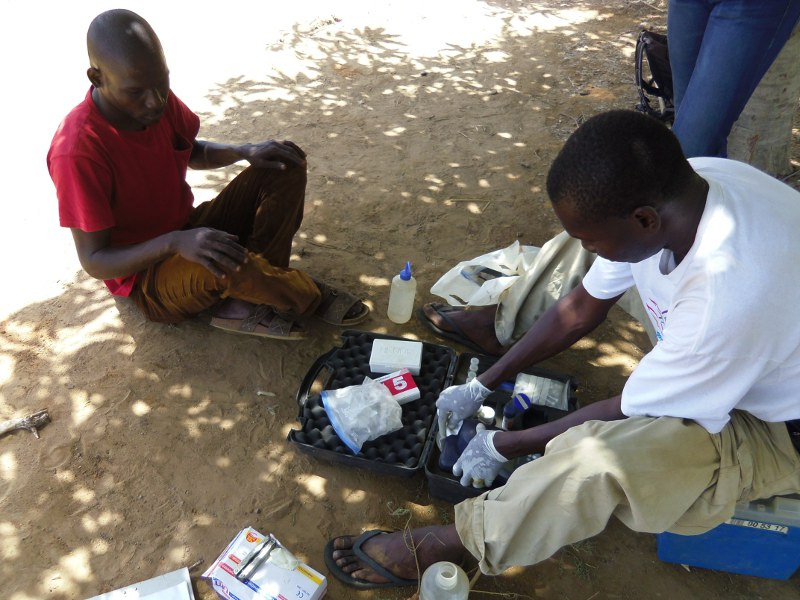 Armand Kuris, a professor at the University of California Santa Barbara, told her about his success in lowering schistosomiasis infections in Kenya by introducing the Louisiana crayfish. It occurred to Huttinger that stocking local water sources with hatchery river prawns could have the same infection-cutting effect. And what’s more, the prawn’s commercial value could make the strategy self-sustaining. Prawns raised, stocked and sold by villagers could maintain an infection-fighting population that doesn’t depend on constant funding from outside foundations or non-profits. “If you can put money in the pockets of people who are outside the cash economy, that’s about as strong a motivator as you can find,” Huttinger said. After a trip to Senegal in 2007 and a few rounds of grant applications, the project won funding from the Bill and Melinda Gates foundation in 2010. That year kicked off 12 months of water quality monitoring prior to their first stocking efforts. The monitoring continues today, both in the river and in the hatchery tanks. Using a YSI photospectrometer, they measure nitrate, nitrite, phosphate, calcium hardness, ammonium, magnesium, iron, and pH. Tracking calcium in the river gave an indication of how the prawns would acquire this mineral for building their thick shells, which they shed many times as they grow. 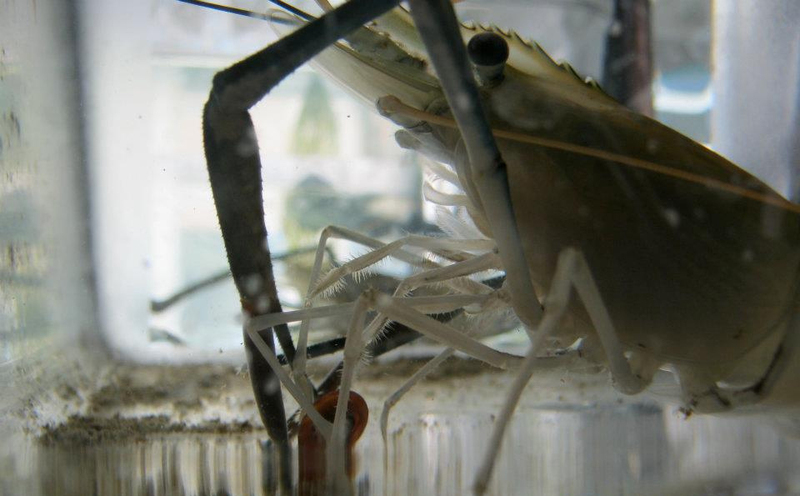 When the project’s river monitoring showed very low levels of naturally occurring calcium, the researchers could assume the prawns would get what they needed by feasting on snails. The more important evidence that the prawns are doing their job is the shrinking rate of infection at the project’s three test sites, where the number of cases has dropped by around 50 percent. Those who do get infected carry a lower number of parasites, which mutes the symptoms. Though that’s good news, the project is still in its early stages. Meanwhile, a species of snail once thought to play host to only the bovine strain of the disease was recently discovered harboring the human strain. A new vector species increases the risk of infection. The rate of infection in a village where prawns haven’t been stocked has recently jumped from 50 percent to 84 percent. The project isn’t ready yet to provide prawns for the whole region, but they’re working hard at their hatchery to get all the parameters right so they can start producing more. Ideally, they’ll soon be hatching not only more prawns but more hatcheries.